Ken Kocienda gives an inside look into Apple’s software development process during his 15 years at Apple. He was there during the release of Safari, iPhone, and iPad. The book is a must read for anyone who develops products or is interested in Apple. (The book is also great vindication for those who believe that A/B split testing doesn’t play a role in a lot of excellent and innovative design, and is a way overused tool today). End with summary of development of Safari, the iPhone Keyboard, and general comments on working at Apple. The title ‘Creative Selection’ does a great job summarizing the book. It is a process of continuous incremental Darwinian evolution that moves an idea towards a final product. Each round of demos & feedback selects for the best features at that time. Each demo also has the potential to introduce new variation and a “fresh divergence” with the decision to pursue a new approach at the next demo. This is how Apple built software. One demo, after another. Improving each time. In short, they did not try to “flip Thomas Edison’s ratio of inspiration to perspiration”. The major ‘takeaway’ from Ken’s book, is the importance of demos in his work at Apple. Without a demo it is very difficult to discuss and compare two ideas or receive feedback. Ken provides the example of asking two people to ‘think of a cute dog’. This is a pretty straightforward and simple concept to think of. However, without a concrete demo it is very difficult to compare two people’s ideas on what a cute dog is. But, once each person produces a picture of a cute dog, a proper discussion can take place. Clear commentary and feedback can be given. And now, we can have progress. It is tough to discuss who has an idea of a cuter dog without a demo. Now imaging trying to discuss and make progress on more complex problems. But with demos this is possible, and multiple designs and their merits can be debated, discussed, and concrete decisions made to choose the best ideas at the time to move forward. The continued production of demos keeps people focused and prevents abstract distractions from getting in the way. No single step in this process results in the final product. But the incremental improvement upon the previous demos is the trick. Good demos moved upward to demos for higher levels of management at Apple. Eventually demos would get to Scott, who made the final decision on if the software was ready to demo to Steve. Everyone present at the demo could contribute their feedback. Demos allow the creator to gauge people’s genuine reaction to using the product. Demos are build like Hollywood backlots. Some parts of them are facades and don’t actually work. Other parts of the demo are interacted with, and require reality. But in the end, the person interacting with the demo, doesn’t know what is a thin backlot and is able to suspend disbelief to believe the demo is real. “Most demos - almost all of them - fail”. Get over the apprehension of failure very early. Because that is the norm for demos. Steve reviewed demos in a boardroom called ‘Diplomacy’. It had a sign above the entrance ‘Know Thyself’. Ken describes demoing for Steve like ‘going to see the Oracle’ - who will speak and decide. He made the final decision on what Apple would commit to. Steve was known to change his mind over time, and contract previous opinions of his. Much has been written on Steve Jobs, I liked Kocienda’s take that although his mood and response were generally unpredictable, his passion was predictable - “he wanted it to be great”. He “respected Steve’s taste, but not his temperament”. From Ken’s description, Steve Jobs would study what was placed in front of him to review with great intensity. Carefully surveying it from all angles. Then he may ask a question - asking someone else their opinion on it, and wait to see their answer. “These were tests”. If you passed them, he knew he could trust you to help make software better. One earned the ability to work closer to Steve by continuously providing good feedback. Steve would make the final call and decide to commit, give specific changes, or ask to see something entirely new next time. Simplicity: what to select for? Steve always chose a design ethos in favour of simplicity. A decision that added complexity back into the design was generally a bad idea. Complexity often resulted in more complexity for the user but then also for the developer and designer. It made everyone’s life more difficult. That’s not what we think design is. It’s not just what it looks like and feels like. The principle that design is how it works gives “taste a purpose beyond self indulgence”. It “removes the arbitrariness of taste”. Taste is a critical part of design at Apple. He describes the process pretty much identical to a process I have stumbled upon myself over the years. Judgment needs to become a “a knee jerk reaction”. This refined like-response results in “the ability for form opinions with your gut, that you can then justify with your head”. One needs to build “trust in a refined personal like-response”. This takes time and requires study of past works in order to assemble a catalogue of things one likes, in order to act as a measuring stick to compare new ideas against. Why is the development of taste & judgment critical? Because you “have to keep making progress. You can’t open oneself to infinite possibilities at each step”. Ultimately each small judgement about taste in the pursuit of design (how something works) must come together in an integrated whole. When this is done poorly, the product becomes off balance. This ability to integrate multiple judgments together is based on a balance of taste and empathy for the user. Understanding their needs an leaning in favour of simplicity over complexity. Many of the decisions that go into a product are ultimately a series of heuristics - subjective decisions based on taste. These heuristics are integrated with some algorithms. How to centre the photo on the page, is based on an algorithm. How long an animation should be or how large an icon should be is based on a heuristic. I agree that too many designers these days try to turn heuristics into algorithms - numerical outcomes that can be ‘tested for’. Sometimes it is quick to decide on the right heuristic. The process of demos provided the opportunity to “put their faith in a sense of taste” while making small decisions each time. This is very different than how other companies and designers operate who are obssed with split testing. When I joined Google as its first visual designer, the company was already seven years old. Seven years is a long time to run a company without a classically trained designer. Google had plenty of designers on staff then, but most of them had backgrounds in CS or HCI. And none of them were in high-up, respected leadership positions. Without a person at (or near) the helm who thoroughly understands the principles and elements of Design, a company eventually runs out of reasons for design decisions. With every new design decision, critics cry foul. Without conviction, doubt creeps in. Instincts fail. “Is this the right move?” When a company is filled with engineers, it turns to engineering to solve problems. Reduce each decision to a simple logic problem. Remove all subjectivity and just look at the data. Data in your favor? Ok, launch it. Data shows negative effects? Back to the drawing board. And that data eventually becomes a crutch for every decision, paralyzing the company and preventing it from making any daring design decisions. As you can see, the inability to have a developed and refined sense of judgment in pursuit of taste and balance prevents one from efficiently designing and developing products. It also prevents one from understanding how the design comes together as a whole - which is the most important part and part which lends itself least to split testing. Split testing can’t test multiple integrated wholes. The process of designing based on popularity, doesn’t result in excellent design. I fully agree with this sentiment. In this age it sometimes feels taboo to even suggest that a designer can make a decision without split testing ideas, (sometimes these sensible people are referred to as “UX cowboys”), I am reassured that during Ken’s time at Apple’s approach was exactly that. And they developed magnificent products. Instead, Apple chose to focus on frequent demos. With each demo being an opportunity for those present to use their sense of judgment and taste to make suggestions, and move forward incrementally. In the end, Apple worked to select for the “the intersection of technology and the liberal arts”. Just as a poet, painter, and author doesn’t disassemble their work to split test it, Apple focusing on the integrated whole of their product. Ken was part of the original three man group in charge of setting up a web browser on the Mac. This was to replace Internet Explorer that had been on the Mac since 1997. It is a great story of how they tried to use open source software - first Mozzila with 1.5 million lines of code (50,000 pages when printed at 30 lines a page). This was impossible to work with. Richard Stallman achieved success using Konqueror - which had only 120,000 lines of code. One-tenth of Mozilla. Part of the reason Mozzila had ballooned to be so large was all the boilerplate code in Mozzila that was required in order for them to try and design software with individual components that could be easily connected to each other like lego blocks. Super Human Progress: Richard got a demo of the Konqueror browser up and running within two days. Whereas Ken and Don Milten had been working on the problem for over 6 weeks using Mozzila. Ken uses this example to illustrate how unlike the physical world (such as Olympics) where physical limits are placed on human performance, there are certain times in software development when one individual can have improvements 10x or 30x over that of other experts in their field. These cases it seems often are early in a project, when there are not limitations in place. And a critical insight into an early stage concept or organizing principle can provide a tremendous improvement over the work of others. Page Load Time: In order to focus efforts on Safari’s development- browser speed, was identified as the single most important feature. Therefore a Page Load Time tool was created to track this metric. Every single change to the code was measured against the Page Load Time. Only those changes that improved it would be accepted. In cases where new code was essential to a new feature, in order for it to be accepted, other code had to be optimized so that in the end there was a net neutral effect on speed performance. The selection of this single real world metric added great clarity to software optimization. Which is often a process that starts too early in software development and without a clear focus on improving ‘real world’ performance. Insertion Point Problem: One of the interesting facts, is that the hardest technical problem he ever had at Apple was getting the “insertion point” at the end of a line in an HTML email text editor to work properly. It seems like something that is incredibly simple, yet was surprisingly complicated. Alternative names for Safari browser were Alexander, Freedom, and Thunder. From the way Ken described the process, it seemed names were proposed by people working at Apple, rather then an external PR firm. (Perhaps a separate firm was involved, but Ken didn’t mention this.) Don Melton recalls the naming story on his blog. 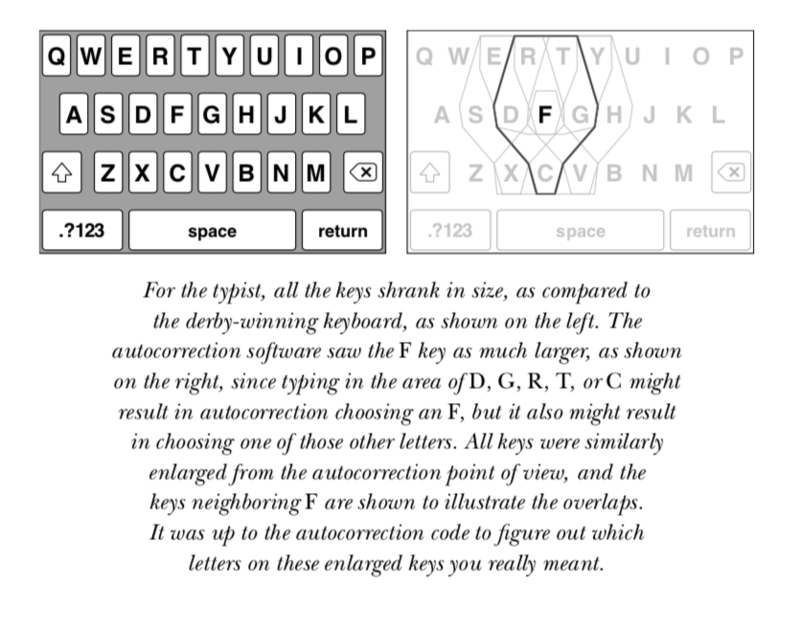 The development of the iPhone keyboard is remarkably long and complicated story. Ken goes into great detail, and reading the original book is highly recommended. The process started when it was discovered that the demo’d version of the iPhone keyboard wasn’t very good and lack of a good keyboard had product killing potential. This led to the Keyboard Derby where staff competed to build keyboards. Ken eventually won the design and spent the next two years perfecting the idea. Multiple demos with different number of letters per key. Different placement of buttons on the screen. Addition of algorithms to convert the garbage someone types in and convert it to the letters they meant to type. Different letter weighting score patterns. Pattern screw algorithms. Addition of touch feedback in having the keys enlarge after each press. Read the book - its worth it. QWERTY was selected as the preferred keyboard arrangement because it reflected the best combination of taste + empathy + craft. Other keyboard designs evoked too much reaction when people saw them because they were different, whereas showing a keyboard that people were used to evoked the most normal reaction and allowed people to use it best from the start. Although the original iPhone only made use of two-point multi-touch gestures, it was capable of handling 11 simultaneous gesture points at once. Though, clearly this was never used as it would require all ten fingers plus your nose. The size of the App icons on the home-screen was determined by a game. Early developers in the office installed a game that would render squares of different sizes on different parts of the screen. The user would click the square and a new one would appear. This was both the iPhone’s first game, and also provided a ton of information on the optimal App icon size based on where it was positioned on the screen. 57px was the final optimal number. When people touch the screen, they actually do not touch with the part of their fingertip they think is touching the screen, but a part lower down on their finger. The software auto-corrects for this. The iPhone keyboard typing sounds are based on the ‘clack’ of a pencil on a desk. Ken was inspired by the idea that when Ben Burke was designing the blaster shot sounds in Star Wars he produced these sounds from a hammer striking a guide-wire for an antenna. Because of the high level of secrecy on everything, this often mean trying to recruit people without being able to tell them what they will be doing. When Steve returned to Apple he removed the separation between research and development and software implementation by disbanding the “‘the advanced technology group”. The research required would be done by the same people who also had to implement the software. DRI - Directly Responsible Individual - person who would sign up and was ultimately responsible for a product or software. They worked in small groups, and this encouraged regular interaction and efficient communication. There were only 7-9 people on the Safari Browser project, and 25 people listed as inventors on the iPhone. Not everything was fancy and new. The Diplomacy room that Steve reviewed software demos in was remarkably unimpressive and in fact drab and old looking. Some mockup designers even in 2008 preferred to use Adobe Director - a software tool from the 1990s - because of how quick they were with the software. No detached high level managers making key decisions. When high level managers did make decisions, they were involved in the project. Steve Jobs would start preparing for keynotes about 3-4 weeks prior to the event, continuously practicing on stage a hall and getting feedback. The traditional term for using your own products in development is “dogfooding”. Ken prefers the term, “living-on”. Either way, it is an essential part of knowing if what you are building is any good. Convergence is the period of getting ready to launch a product and fix all the bugs. Their Radar software tracks the bugs during the time, and the goal is for the line to move downward. Heisenbug - is when software’s behaviour is mysterious yet the bug causing it cannot be found. Most of the time, I focus on finding the best possible solution to the current problem, then I try to balance out the new solutions with all the previous ones. Repeat. Don Milten - worked on original Safari browser. When at Netscape he helped them to remove all the profanity from the codebase before Netscape when public. Watch 6 hours of interviews of interview with Kenneth Kocienda and Richard Williamson on their careers at Apple, recorded by the Computer History Museum in 2017. Part 1. Part 2. I listened to this book on Audible and took notes while listening at the gym. I have tried to be reasonably accurate in the quotations, and place in quotes around phrases that I thought are near direct quotations from the text. I, and auto-correct, likely have made errors in this process. Please notify me of any errors or unattributed quotations so I can fix them.